Today I will share the craziest, most delightful thing I have made. After talking about serious stuff like getting your colourful veggies, and portion sizes, I have to mix things up! This cake tastes like a 75% dark chocolate flourless chocolate cake, crossed with a peanut butter cup. It has no refined sugars, and lots of fiber and protein. Most importantly: it tastes amazingly rich. This recipe reminds me of how I would appreciate certain BIG things when I was little. Like The Big Apple (which you might have seen, if you’ve ever driven between Toronto and Montreal. This dessert is amazing like the Gibeau Orange (Orange Julep) in Montreal, which is a giant orange. The servers come out to your car on roller skates, it’s pretty fantastic. I doubt that place would suit my current dietary choices these days, but that’s not the point. The point is is that giant food stuff can be a little magical, and make you feel like a kid again. I guess I’m up for one of those odd landmark road trips, it seems. Yup. Giant food, it makes me smile. It all started when my grandma slipped me a twenty. Sometimes she does that when I visit. And it is my belief that when your grandma slips you a twenty, you buy something FUN. I was all set to finally pick up some springform baking pans, as I don’t have any. But then, there it was. The giant cupcake form. One cake pan with space for two cakes: one that looks like the bottom of a cupcake, and one that looks like the top. You make them, and then stack ’em together. But I saw beyond the cupcake. I saw something that looked like a Reese cup, and something that looked like a Hershey’s Kiss. This pan did double duty! And that is how I met the crazy cake pan that made this recipe possible. I realize the boom in the cupcake industry has already come and gone. But I don’t mind. 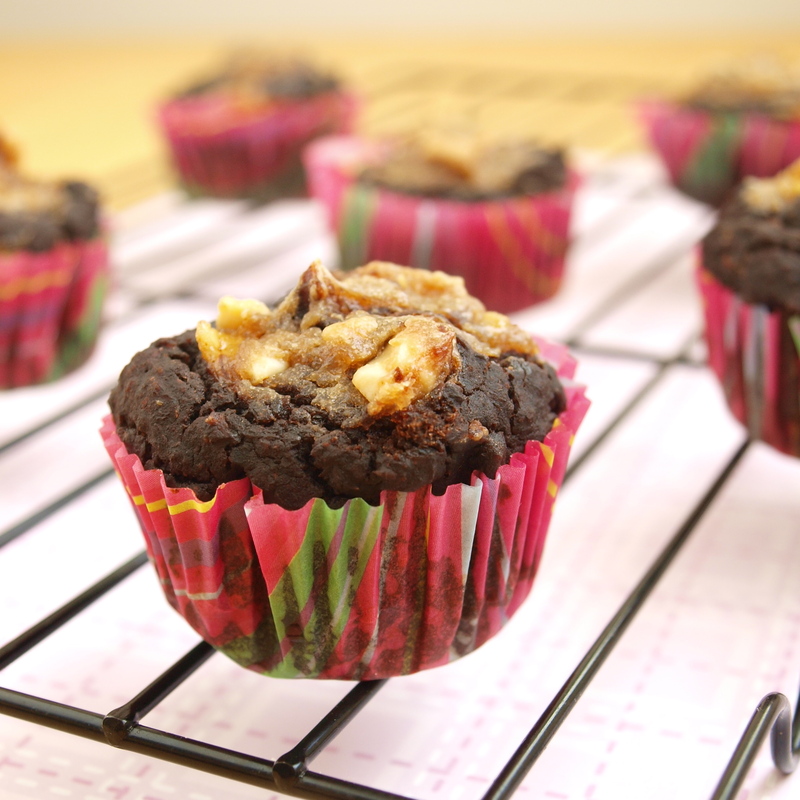 What about the boom of delicious, balanced and healthy cupcakes? That boom happens today. I am not complaining. If you don’t have a giant cup cake, do not fear! As I’ve been adapting and trying out recipes in different moulds, I’ve found that as long as you follow the baking directions specified for a mould of the size you’re working with, you’ll be okay. Here’s the recipe! If you are not as insane as I am, or are not baking in preparation for a sleep over party, feel free to divide this recipe in half. In the food processor, pulse together dates and beans. Add a little milk after a minute or so of pulsing, to help further break down the ingredients. In a bowl, combine all dry ingredients and mix. Grease your pan(s)! I used coconut oil, and then floured it. In a separate bowl, mash your bananas (I like to use a potato masher), and then mix in the peanut butter until evenly combined. If you want to use a different mould, like a regular cupcake, just follow typical baking times for that size. Normally minis wouldn’t bake for this long, but I had the low temperature for the big deep pan. These turned out great! This cake was definitely rich enough on it’s own, but I needed to kick this up a notch. I needed to cover it in a chocolate shell. A dark chocolate shell. This step needs to happen after the cake has cooled. I melted some dark chocolate chips in a double boiler (you could microwave), and loosely slapped it on, using a spatula. 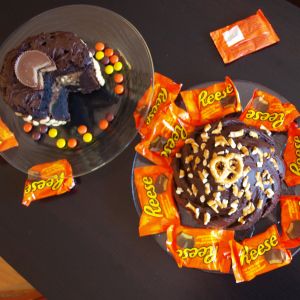 On my “kiss” cake, you can see that I also added some pieces of pretzel to the wet chocolate. On the reese cake, I put peanut halves on top of the chocolate coating. This amped up the sweet/salt theme, and added a nice crunch, of course. Then I put it in the fridge to cool. (Keep it in the fridge, but you can wrap it once it’s solidified). Mini cupcakes: portion control, or an excuse to eat more than just one? The perfect slice of the reese cake. If you could have a dessert inspired by any candy or chocolate bar, what would it be? That is one intense cupcake…! I don’t know how I found your blog – but I’m so glad I did. I am babystepping my way into cleaner desserts and I’m not great at finding good binding substitutions to get the texture I want. I’m so inspired by your recipes and can’t wait to whip some up! Lauren, this is simply amazing! Now that’s just my kind of recipe. I don’t even think I’d have to make any substitutions! Brilliant! I definitely will be trying this one! 🙂 Wow does it ever look good! I made the mini cupcakes (plus a small round cake) the other day and it didn’t turn out quite as rich or sweet as I expected. Are you against adding extra dates or some coconut oil for extra richness/sweetness? Or mixing something other than banana into the peanut butter, so that the peanutty flavor really stands out? These are delicious, but my nostalgia demands more peanut buttery, milk chocolatey sweetness. Thanks for stopping by and for trying these! I’m definitely a dark chocolate over milk chocolate person, and this cake reflects that. 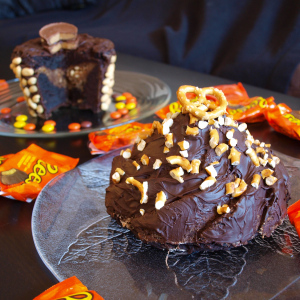 I am all for whatever substitutions you need to make this your dream cake! I think that if you added some Stevia powder to the chocolate part..and to the peanut butter part it might be more what you were hoping for? Stevia would work easily because it’s so small that it won’t change the texture of the rest of the cake. Did you peanut butter have salt in it? If not, that could also help to pop the flavor. More coconut oil would make it more moist…do that if you think it’s what it needs, but I remember mine being pretty rich in texture. Hope these ideas help! Let me know if you give it a shot again! 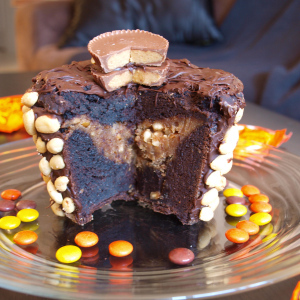 I LOVE peanut butter and really want to make this for my birthday haha. Do you remember how many servings this makes? Hi Steph–happy early birthday! This makes lots of servings..I forget exactly how many. I made an entire giant cupcakes (using this Wilton mould: http://www.wilton.com/blog/index.php/how-to-make-a-giant-cupcake/ Plus I had some extra batter to make some mini cupcakes too. And it’s a dense rich cake. I want to say at least 16 generous servings. Let me know how it goes! I’m very intrigued by this recipe, is there a particular reason you use egg whites only and not the whole egg? Also can you suggest a sub for the banana in the filling? maybe chocolate chips? Thanks! Hi Terri! Great question! At the time I created the recipe I would have used the egg whites to increase the protein content…but knowing what I know now I would probably opt for the whole egg. 1 egg is about 1/4 cup, so feel free to replace each 1/4 cup whites with 1 large egg. 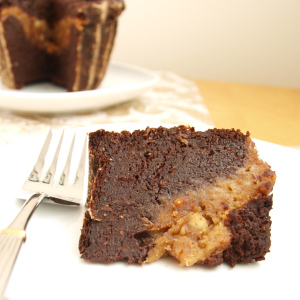 The banana adds moisture and helps the texture of the filling. If you cook down an apple sauce so it’s a little more concentrated and sweeter that could work. Let me know how it goes!